Orders placed by 1.00pm are picked the same day and deliveries are made within 48 hours. Deliveries are only made Monday to Friday. Orders placed on a Friday before 5.00pm will be delivered Tuesday (Excluding bank holidays). All orders placed online on Saturdays and Sundays, will be picked on Monday for delivery on Wednesday. Items ordered outside of postcode areas L, WA and CH are delivered by national courier and a signature is required. Delivery can take place anytime between 9am and 5.30pm. A specific delivery time cannot be supplied. Delivery is free on UK mainland orders over £50.00 (ex vat). 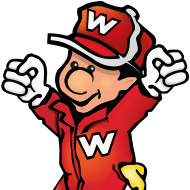 Delivery is free on orders over £25.00 (ex vat) to postcode areas L, CH and WA. For delivery on UK mainland orders below £50.00 (ex vat) and £25.00 (ex vat) to postcodes L, CH and WA a fee of £4.95 is charged. Please Note: Wray Bros can only fulfil orders UK mainland orders. If you wish to return an item for a refund or exchange, please advise us in writing by emailing [email protected] within 7 days of receiving your order. Please be advised that there will be a handling charge of 10% of the invoiced value. Delivery costs will only be refunded, if the goods are faulty.